Polish rabbi of the seventeenth and eighteenth centuries. He was a pupil of Solomon Luria, and was successively rabbi of Miedzyboz, Brody, and Przemysl. Fürst ("Bibl. Jud." iii. 120) and Benjacob ("Oẓar ha-Sefarim," p. 86) identify Moses ben Isaiah with Moses Wengrow, the author of "Berit Maṭṭeh Mosheh," a commentary on the Pesaḥ Haggadah, with novellæ on the treatise Zebaḥim (Berlin, 1701). 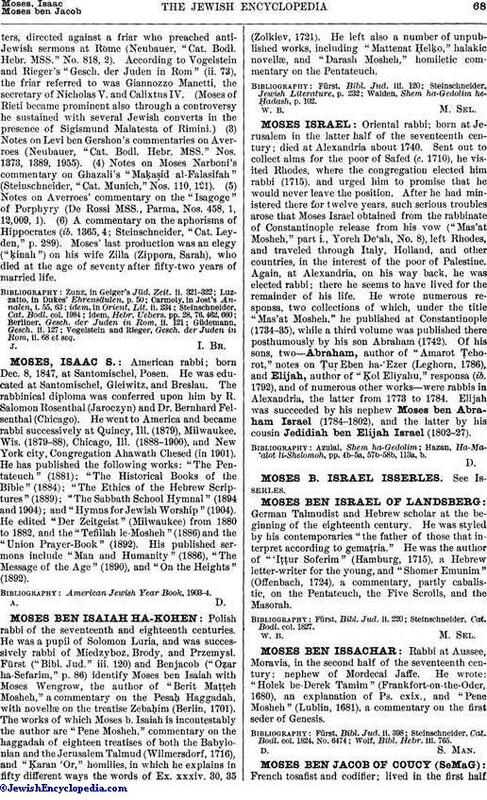 The works of which Moses b. Isaiah is incontestably the author are "Pene Mosheh," commentary on the haggadah of eighteen treatises of both the Babylonian and the Jerusalem Talmud (Wilmersdorf, 1716), and "Ḳaran 'Or," homilies, in which he explains in fifty different ways the words of Ex. xxxiv. 30, 35 (Zolkiev, 1721). He left also a number of unpublished works, including "Mattenat Ḥelḳo," halakic novellæ, and "Darash Mosheh," homiletic commentary on the Pentateuch. Walden, Shem ha-Gedolim he-Ḥadash, p. 102.